Rocky vs. Creed. The Big 5. The Prep vs. everyone else (for the record, FTP). Philly is a city of rivalries, both real and fake. 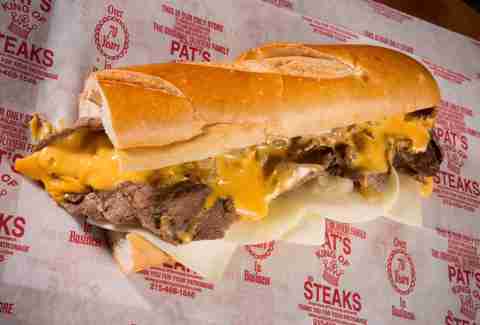 But there's only one feud that seems to get round-the-clock attention: who makes the better cheesesteak, Pat's or Geno's? 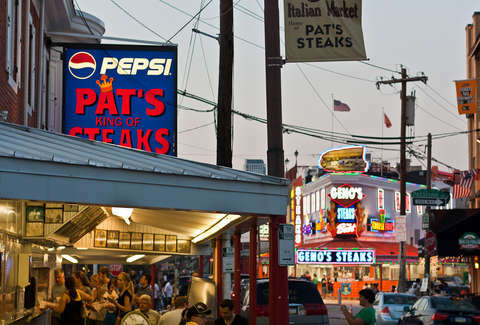 Pat’s was the first steak shop in Philly, and is credited as the first place in the US to sell a steak sandwich. The history of how it got to selling the iconic sandwiches in the first place is unusual, according to Frank Jr., whose great-uncle ("my grandfather’s older brother") opened his eponymous business in 1930. Back then, it was a hot dog stand on the triangular corner of 9th St, Wharton St, and Passyunk Ave, and Pat was eating his own menu every day -- that is, until he got sick of it. "He sent my grandfather [his brother, Harry] to the butcher to get some steak," says Frank, "and Pat cooked it up on his open-air hot dog grill and was going to have it with an Italian loaf and some grilled onions." One of Pat's regular customers, a local cab driver who came by for a hot dog every day, caught him in the act, and asked to try one of these new concoctions himself. (This was 1933.) "My grandfather said, 'I don’t have any more, but you can have half,'" says Olivieri. "So he gave it to him and that’s how it started." As for Geno's, Frank, Jr. was two years old when Joey Vento opened shop in 1966, so his firsthand memory is admittedly foggy. But after 10 years of peaceful, side-by-side cohabitation, we find the first inkling of a feud, thanks entirely to a little movie called Rocky. The rivalry begins with Tony Gazzo. 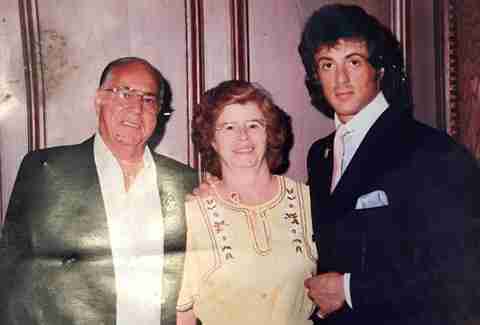 Or, for you Rocky aficionados, the Italian Stallion's loan shark boss. In Rocky (the original and best), released in 1976, Gazzo takes Rocky for a cheesesteak at Pat's. With the movie's popularity, trips to Pat's became a thing to do. And when you trek all the way down to South Philly, you might as well try the other place across the street. The Oliveri's and Vento's tended to play up their manufactured rivalry, with Joey Vento usually taking the lead. “He would put signs up -- 'The Best,' 'Ace beats King,' 'No need to order double meat, walk across the street,' trying to make it seem like his business was cleaner, better, flashier," says Oliveri, who gives Vento credit where credit is due. These slogans and campaigns weren't born from malice; it's just business. Both men, however, have no problem hamming it up for the cameras and trash-talking the other's shop in interviews. It became embedded into the shops' personas that a fierce rivalry had sprung, though off the clock, this long-perpetuated narrative could not be further from the truth. While work was "the battlefield," both Frank, Joey, and their wives (Rita and Eileen) all grew up together, and they were good friends and cocktail buddies outside of their respective corners. But the family businesses are serious ones, and just because they were friends didn't mean they swapped steaks. Both Frank and Joey claimed to have had each others cheesesteaks only once, during a taping of the Dr. Phil show in 1999 in a segment called "Cheesesteak Wars." The on-air pop psychologist claimed that "the Mideast crisis is nothing compared to this," which, in 2016, is decidedly insensitive. After some convincing, the steak moguls agreed to try to each other's sandwiches; both took one bite and simultaneously spit it out (unscripted, according to Frank, Jr.). Frank, Jr. also had a bite of a Geno's steak for the first time at Philly's First Cheesesteak Festival... no word on whether he spit it out then, too. There are other instances where you can find the Pat's and Geno's camps cooperating. For example, prices have always been the same on both sides of the street. Cheesesteak collusion? Probably, and that's OK. The Oliveri's and Vento's seem to have a gentleman's agreement on how much a steak costs, so don't expect to save (or overpay) on either. Finally, catch these cats leaving the same apartment building in the morning. That's right: Frank, Jr. and Geno (and Tony Luke) live in the same building in Philly. Care to know where? It's the only apartment building wit whiz on tap. 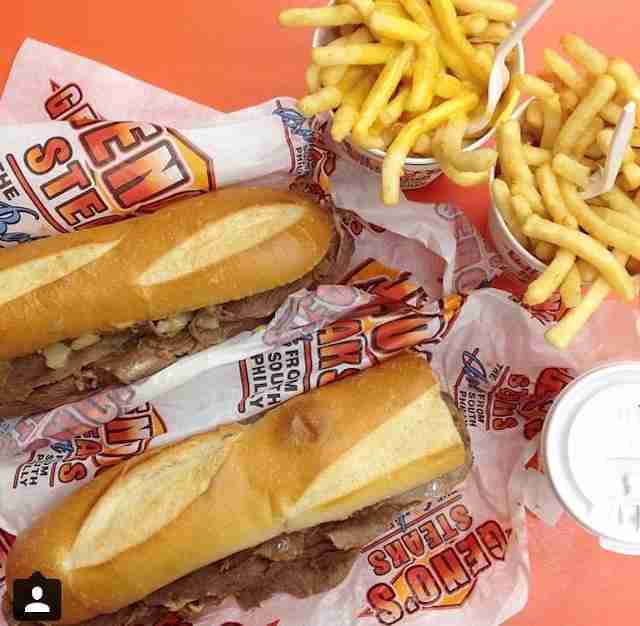 When ordering a steak, it's always whiz wit out. Follow Dan McKay on Twitter or Instagram @dannypageviews.